If you haven’t heard, you can prepare a post and schedule it to appear later by adding a date and time in the future before you post it. You can schedule a post up to 6 months in advance in 15-minute intervals. As of recently, you can edit the copy of your post too. I’ve included a couple of screen shots to help guide you through the process. If you’re not already a BrandLove, LLC Facebook Fan, please “like” my page. There are lots more social media tips and information. My fan page is updated daily. Thank you for your support! Now, as promised here’s step by step instructions on scheduling and editing your post. Scheduled posts will appear at the top of your activity log. From here, you can change the time your post is scheduled, publish the post or cancel the post by hovering over it and clicking the menu. If you want to edit the copy, tag your photo or add the location, click on the photo and choose which option you would like to edit. Love this! Now I can do the bulk of my posting on the weekends when I have more time! Wow, very cool, never new that. Cool tip, but what if you want to post pictures or a new album? I would like to know how to schedule that so I can do a session process the images at 11pm at night and have them upload onto facebook and post at 11am the next day during the prime window for viewing. Do you know how? 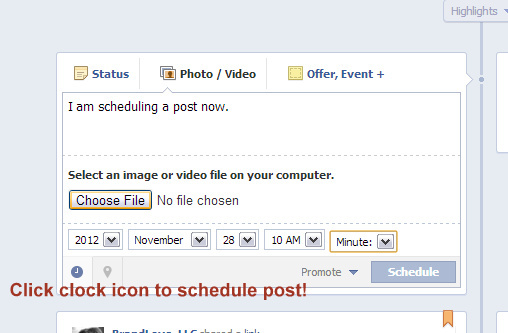 After you upload your photo or album on your business page and enter the copy for your status update, in the bottom left hand corner, there is a little clock. Click on the clock icon and enter the year, month, day, hour and minute. Then click schedule. (i have updated the screenshot in the article. I didn’t realize the link was broken.) You can view and edit your scheduled post from your activity log afterward if you want. (There is also a screenshot.) I hope that helps!